The Vocational Nursing (VN) Program at CNI College has been ranked as one of the top practical nursing programs in the state of California, according to PracticalNursing.org. The Vocational Nursing (VN) Program at CNI College has been ranked as one of the top practical nursing programs in the state of California, according to PracticalNursing.org. PracticalNursing.org is a national organization dedicated to providing students with better transparency regarding practical and vocational nursing programs throughout the country. This year’s rankings were based on NCLEX-PN exam passing rates. Used by nursing state boards around the country to test proficiency, passing the NCLEX-PN is required in order to receive nursing licensure. The NCLEX-PN exam passing rate is considered to be one of the best measures for determining how well a school is preparing their students for a career in nursing. 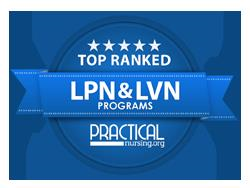 Each year, PracticalNursing.org uses a ranking methodology to rank the top LVN programs, classified by state. The organization begins by retrieving NCLEX-PN pass rates from all LVN programs for the past five years. These pass rates are then averaged, weighted by the recency of the exam, and ranked. With a NCLEX-PN pass rate of 88.58%, CNI College was ranked among the Top 50 colleges in California for becoming a licensed vocational nurse. In the past five years alone, more than 92% of CNI students passed the NCLEX-PN Exam. CNI College is accredited and approved by the Bureau of Health Education Schools (ABHES) and the Board of Vocational Nursing and Psychiatric Technicians (BVNPT), respectively. CNI College’s VN Program offers 12-month full time or 19-month part time schedules, with day, evening, and weekend classes available. CNI College’s VN Program is designed to enable students to acquire the knowledge, skills, and competencies related to enhancing the health and well-being of patients. CNI College is a healthcare career college located in Orange County, providing academic educational opportunities in the allied healthcare industry. CNI College offers career training programs for an Associate’s Degree in Nursing, vocational nursing, medical assisting, MRI technology, personal fitness training, pharmacy technician, surgical technology, and massage therapy. CNI College is devoted to the community we serve and committed to our graduates’ successful employment in the healthcare field. For more information about CNI College, please visit http://cnicollege.edu/ or call 800-219-0634.